Eid prayer (Arabic:صَلاة العيد) is a prayer which Muslims perform on Eid al-Fitr and Eid al-Adha after the sunrise. According to Shi'a jurisprudence performing this prayer in jama'a (congregationally) is wajib (compulsory) during the time that an infallible Imam is present and is mustahab (recommended) during the time of occultation. According to Hadiths the words "tazakka" (Arabic: تَزَکّیٰ, purifies himself / gives the charity) and "fa-salla" (Arabic: فَصَلّیٰ, then prays) in two verses of Sura al-A'la, "Felicitous is he who purifies himself * celebrates the Name of his Lord, and prays" means giving Zakat al-Fitra and performing eid prayer. Jabir has narrated that Prophet Muhammad (s) took all his family members out on eid day. On the days of Eid al-Fitr and Eid al-Adha God looks upon the earth with his grace. So come out of houses so that his grace reaches you. Who goes out for eid prayer should wear his best clothes and use his best perfume. Ibn 'Umar narrated that prophet Muhammad (s) went to and returned from eid prayer barefoot. Abu Rafi' narrated that prophet Muhammad (s) went to eid prayer barefoot, performed the prayer without adhan and iqama and returned barefoot from a different route. It is narrated that Imam 'Ali (a) went out on the day of eid and kept saying takbir (Arabic: الله اکبر, trans. Allah akbar) until he reached the place of performing eid prayer outside the city (Kufa). The time of performing eid prayer is from the sunrise to the shar'i noon of eid day and if it is missed it has no qada' (compensation). It is mustahab (recommended) to perform eid prayer on Eid al-Adha after sunrise and on Eid al-Fitr it is mustahab to eat, give zakat al-fitra then perform eid prayer after sunrise. For the full text, see Text:Supplication for Qunut of Eid Prayer. Muslims performing Salat al-Eid in Masjid al-Haram. Eid prayer consists of two rak'as. After Sura al-Fatiha in each rak'a another sura from the Qur'an is recited; however, it is better to read Sura al-Shams in the former and Sura al-Ghashiya in the latter or Sura al-A'la and Surat al-Shams respectively. After reciting sura in the first rak'a, there are five takbirs followed by five qunuts and in the second rak'a, four takbirs with four qunuts. Any supplications or prayers will suffice in the qunuts, like the other prayer, but it is better to read a special supplication. When an infallible Imam is present, eid prayer is wajib (compulsory) and it must be performed in jama'a (congregationally). During the period of ghayba (occultation) eid prayer is mustahab, yet there are disagreements among faqihs (jurists) in performing it individually or congregationally during this period. Eid prayer does not have adhan and iqama, however, it is mustahab that mu'adhdhin says for three times "al-salat". Imam of eid prayer must deliver two khutbas (sermons) after eid prayer; however, leaving khutabas is permissible during occultation. It is mustahab that one eats date on Eid al-Fitr before eid prayer and on Eid al-Adha eat from the meat of sacrifice (udhiyya) after eid prayer. If someone doubts about the number of takbirs and qunuts that he has performed, he should decide the lesser side, if he did not pass the stage of that act. On Eid al-Adha, it is mustahab to say this phrase after those takbirs "Allah is the greatest, for He gave us quadrupeds and all praise is for Allah, for having tested us (اَللّهُ اَکبرُ عَلی ما رَزَقَنا مِن بَهیمةِ الاَنعامِ وَ الحَمدُ لِلّهِ عَلی ما اَبلانا) after 10 daily prayers (the first of which is Zuhr prayer on eid day and that last one is Subh prayer of 12th of Dhu l-Hijja). For those who are in Mina, it is mustahab to say those takbirs and its following after 15 daily prayers (the first is Zuhr prayer on Eid day and last is Subh prayer of 13th of Dhu l-Hijja). It is mustahab to make ghusl before eid prayer and read narrated supplications before and after eid prayer. It is mustahab in eid prayer to put the head on the earth in sajda and raise the hands while saying takbirs during prayer and recite eid prayer loudly. 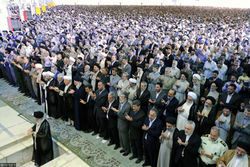 It is makruh (disliked) to perform eid prayer under a roof. ↑ Ṭabāṭabāyī, al-Mīzān, vol. 20, p. 269. ↑ Mutaqī al-Hindī, Kanz al-ummāl, vol. 7, p. 88. ↑ Mutaqī al-Hindī, Kanz al-ummāl, vol. 8, p. 548. ↑ Qāḍī Nuʿmān, Daʿāʾim al-Islām, vol. 1, p. 185. ↑ Majlisī, Biḥār al-anwār, vol. 88, p. 118; Mutaqī al-Hindī, Kanz al-ummāl, vol. 7, p. 88. ↑ Khomeini, Taḥrīr al-wasīla, vol. 1, p. 273. ↑ Khomeini, Tawḍīḥ al-masāʾil, p. 234. ↑ Khomeini, Taḥrīr al-wasīla, vol. 1, p. 274. ↑ Khomeini, Taḥrīr al-wasīla, vol. 1, p. 247. ↑ Khomeini, Tawḍīḥ al-masāʾil, p. 235. Khomeini, Rūḥullāh. Taḥrīr al-wasīla. Tehran: Muʾassisa-yi Tanẓīm wa Nashr-i Āthār-i Imām Khomeini, 1387 Sh. Khomeini, Rūḥullāh. Tawḍīḥ al-masāʾil. Tehran: Muʾassisa-yi Tanẓīm wa Nashr-i Āthār-i Imām Khomeini, 1386 Sh. Mutaqī al-Hindī, ʿAlī b. Ḥisām al-. Kanz al-ummāl fī sunan al-aqwāl wa l-afʿāl. Beirut: Muʾassisa al-Risāla, 1413 AH. Qāḍī Nuʿmān al-Maghribī. Daʿāʾim al-Islām. Edited by ʿĀṣif Fiyḍī. Qom: Muʾassisat Āl al-Bayt, 1385 AH. Ṭabāṭabāyī, Sayyid Muḥammad Ḥusayn al-. Al-Mīzān fī tafsīr al-Qurʾān. Qom: Daftar-i Nashr-i Islāmī, [n.d]. This page was last edited on 1 July 2018, at 11:21.